Today I want to share with you another awesome resource for your roleplaying games. A person who identifies him or herself only as crobi created a great online program called RPG Cards that allows you to create and print small cards to use as handy references for spells, monsters, magic items, and the like. It uses some fairly simple formatting code, which you can view on this page, and allows you to customize with a variety of rich text, images, and colors. There is also a sample file you can view that shows you a variety of different cards whose code you can then use as a starting point for your own cards. 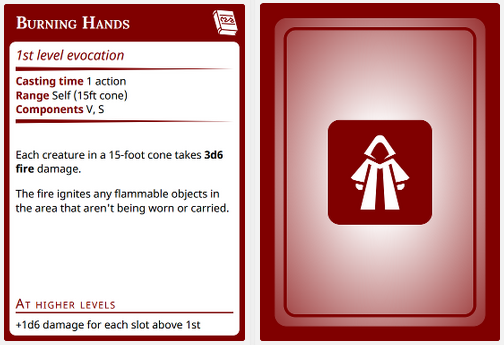 Once you created your cards, you can print them out on A4 size page, which fits 9 cards altogether on the default settings. But of course, the size of each card, and the size of the paper you want to print them, it just one of several different options you have at your disposal. You can also save the file locally and then load it back up next time you come to the website, although the page itself records its last state so everything is just as you left it next time you come to the site (assuming you're accessing it from the same computer and same browser as before). They are surprisingly fun to make and play with. Why not give it a try?